So I bought Gameshow yesterday for my iMac Pro. Setup seems fairly simple but right away at my first tests (both streaming and recording) I realized that the video is very choppy and tons of dropped frames. Maik Lohse There's an odd situation with licensing that, once licensed, the support ticket field is disabled. Temporarily deactivate Gameshow and you should be able to send in the Support Ticket. Send in separate tickets for the performance issue and that you had to deactivate in order to send in a support ticket. Maik Lohse There are several things to look at if you're getting low frame rates so you'll have to do some testing. 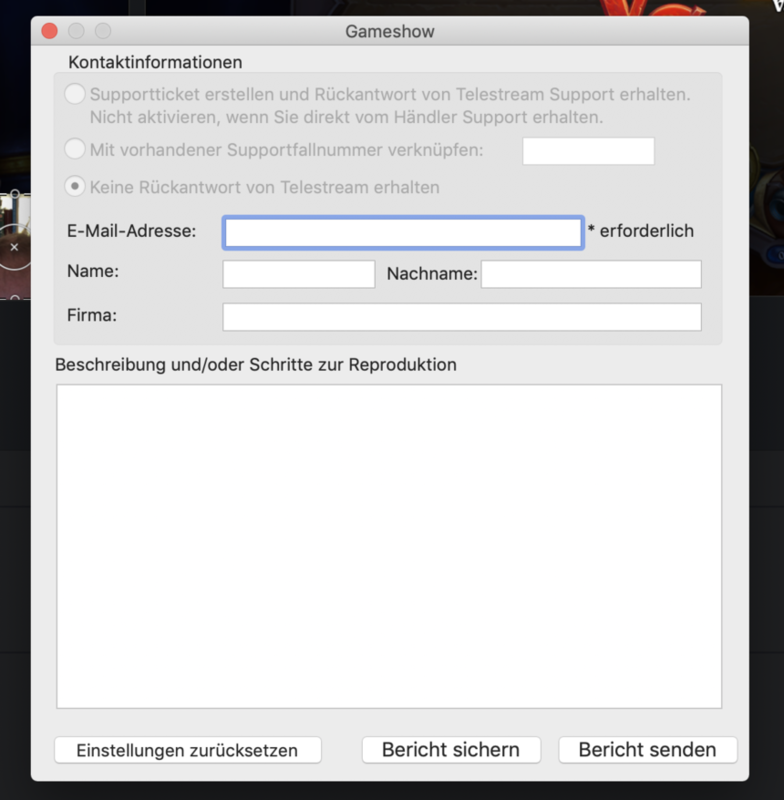 Gameshow has three capture modes, Monitor, Window, Game. It's possible that one may work better than another in some circumstances. To confirm that try changing the mode and testing. It's possible that the specific game's use of the iMac Pro GPU might be impacting the game's capture. Try testing with another game. Also you can try with a blank document and try capturing a YouTube video playing in Safari and see how the frame rate looks. Thanks. That's important because will help determine if it's the game or more generally a computer issue. BTW I have the iMac Pro as well and haven't noticed issues at least with YouTube in Safari. Maik Lohse You may have a problem with your system. Using GameShow 4.5 and Screen Capture Window I can capture a YouTube Video in Safari and plays without issue. Perhaps something is interfering with your Screen Capture. Create a New User Admin account. and reboot the computer and login to the new account. Play a Youtube Video in Safari and capture in GameShow using Window and just record to your internal SSD. Maik Lohse So if you're seeing the same thing in Wirecast it must be something about how the game is being handled. Even though you're only using the Wirecast trial please post in that (Wirecast) forum. If you can do the test with Bootcamp again as (just to confirm the same results) as they developers my jump up the priority (and that will also impact GameShow as well). Thanks in advance for doing that. CraigS I hear ya. But if that's the case (that it is because of the game) then why was the YouTube video choppy as well? CraigS So here is another interesting tidbit. Just tried to things. I had the Twitch App for Mac open and watched someone streaming. In the background I had my game open. Tried to capture the game with "Game" and "Window" mode - choppy. Then tried to capture the Twitch App with Window mode - also choppy. But if that's the case (that it is because of the game) then why was the YouTube video choppy as well? If the game is choppy in Wirecast that's what the encoder sees and that's what is sent to YouTube. That can certainly happen depending on what's being captured. For better and more thorough testing please post in the Wirecast forum and we'll go through tests with Wirecast 11 free trial. Maik Lohse Gameshow updates to fix issue may still happen. No new features though. Please follow up with your Gameshow case number and ask about status update on your issue. Maik Lohse Window mode will have a lower frame rate than Monitor mode. In many cases it's better to display a source in full screen and use Monitor. Both Wirecast and Gameshow behave the same way. It's a limitation on how the OS/GPU is handling things unfortunately.